Imagine you own a technically highly developed firearm that will only work when it is in your hands. It is the central element of the Armatix Smart System. The weapon is ineffective without the digital watch that goes with it, which is needed to make the weapon ready for discharge. Even if you have the combined hardware in your hands, it does not end there. 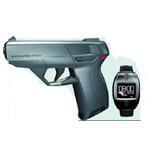 The weapon cannot be unlocked or discharged until the owner's fingerprint or a PIN has been identified on the watch. The iP1 pistol is available as a PIN and as a biometric system, and has just been approved in the U.S. Once the biometric transmitter is activated, the weapon user doesn't need to do anything else to make the iP1 ready for discharging. The weapon communicates continuously with the radio strap, the Armatix iW1 Watch. If the weapon moves more than 40 cm from the wrist of the authorized marksman, such as during a fall or if someone snatches it away, it is immediately deactivated and may no longer be discharged. The iP1 is a .22 long-rifle caliber weapon.